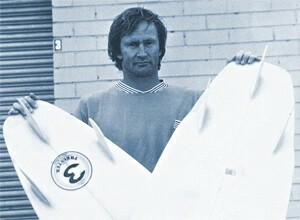 Simon Anderson "2001 Surf Culture"
The "Gentle Giant" from Narrabeen in Sydney, Australia created the three-fin Thruster in the 80's and changed the way we surf. This has somewhat overshadowed his great competitive career which began as the Australian Junior Champion in 1971. 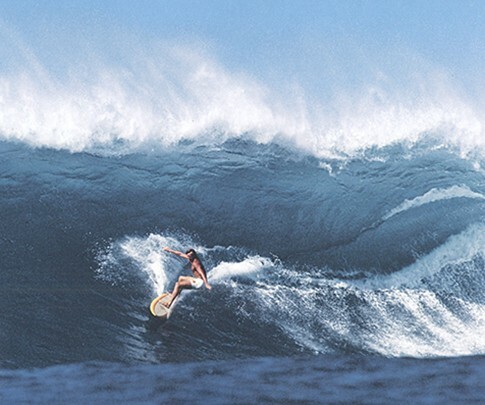 One of the pioneers of professional surfing, Simon was a consistent World Tour winner, taking out the Bells Rip Curl Pro twice, the Coke Classic in Sydney, and the Mountain Dew Pipeline Masters. Two of those victories, one at Bells and the Masters were on his revolutionary Thruster that helped validate the design.